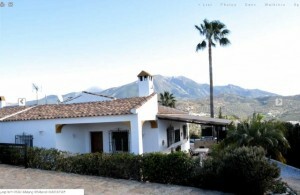 : Villa Kukis is located on the popular development of Cortijo Romero, which is on mains services and has good tarmac access and street lighting. The villa is all on one level and located on a corner plot. This lovely property is only a twenty minute drive from the Mediterranean sea and a fifteen minute drive to the beautiful National Park of Alcaucin. It is only 40 minutes from Malaga airport and in the perfect location. The property is fully walled and secure, with metal entrance gates and parking for two cars. At the front of the Villa there is a large covered terrace with ample sitting areas and a built in barbeque. The pool is 8 x 4 m with roman steps and stunning south east facing views to Mount Maroma. Inside the villa there is a good size lounge/dining area with patio doors that open on to the covered terrace. There are vaulted ceilings, a built in wood burner, AC unit, fly screens and blinds on all windows. Just off the main living area is the fully equipped fitted kitchen, with electric appliances. There are three good sized bedrooms with high ceilings, ceiling fans and fitted wardrobes. The two twin rooms share a shower room and the master bedroom has its own en-suite bathroom. This villa is fully established and ready to move in to. This property is perfect as a family home or a lovely holiday home. Viewing highly recommended.